Chichén Itzá - Image from about.com Yucatán has been called the country that resembles no other. It is the place where the ancient Maya chose to live and developed their astonishing civilization, a land on which many magnificent ruins remain and have become archaeological sites visited by hundreds of thousands of tourists every year. They include Chichén Itzá, today considered one of the new seven wonders of the world, and many others like Uxmal, Kabah, Labná, Sayil, Mayapán, Dzibilchaltún and Ek Balam. 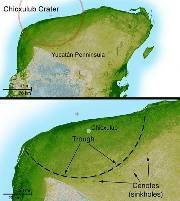 The Yucatán peninsula was discovered during the last trip of Columbus in 1502, but the Maya civilization dates back over 4,000 years; the classical period, when the Mayan culture made its most astounding achievements in astronomy, calendars, mathematics and architecture, flourished in the years 300-900 A.C. It is also the place where an enormous meteorite -- probably an asteroid of some 10 km (6.25 miles) in diameter -- fell, generating the so-called Chicxulub Crater of 180 km (112.5 miles) in diameter, one of the largest impact structures in the world, which caused the extinction of dinosaurs on Earth some 65 million years ago according to the most accepted theory today (see "Chicxulub Crater" in Wikipedia). In a land of limestone rock without a single river and with very few bodies of water on its surface, the crater also formed the famous cenotes (sinkholes) which supplied the Maya with water to live in this region. With hot subtropical humid weather, the Mexican state of Yucatán occupies the northern part of the peninsula facing north on the Gulf of Mexico; the main port of Progreso is approximately 600 nautical miles due south from New Orleans, Louisiana USA. Mérida, the state capital, is a colonial city of 800,000 people, where the Spanish conquistadores built the first cathedral on the American continent's mainland in the 16th century. It is a very nice city, 30 km (19 miles) inland from Progreso, with lush vegetation and with rich folkloric and culinary traditions. A fair portion of its inhabitants still speak the Mayan language of their ancestors and keep many of their traditions alive. Mérida is 320 km (200 miles) from Cancun by road and there are direct flights to Mérida from Miami and Houston. Mérida is home to the Aquaparque, a public park dedicated to aquatic plants. Yucatán has enormous water reserves, with vast rivers flowing underground; in Mérida the first water table is 6-7 meters (20-24 feet) beneath the ground level. The Aquaparque is located on an old open-mine pit site, a limestone quarry from which they extracted saskab (in Mayan, white soil), a soft limestone aggregate used for road building, and is approximately 6.5 meters (22 feet) below street level, so that one can look down on the park from the bordering streets. The park's water is in fact the first water table, the level of which goes up and down depending on the rains and shows major changes throughout the year. In 1998 Patricio Patrón, the city's mayor, decided to build a public park on that site, so several canals and a large lake were dug until the water table covered a good portion of the area. However, after several hurricanes and years of neglect, the place was quite deteriorated and abandoned. In 2006 State Governor Patricio Patrón wanted to rehabilitate the park he had started when he was mayor of Mérida, so he asked me to present a project. I presented a proposal to transform it into the first public park in the country dedicated to aquatic plants. With landscape architect César López Negrete we developed a master plan for the development of the Aquaparque, locating 16 ponds for water gardens, establishing the conservation areas, and defining the varieties of trees and plants to have in each area. The park has a total area of some 15 hectares (37 acres), and of the area below street level (10 hectares, or 25 acres) some six hectares (15 acres) are covered with water year round. The large lake has an area of 33,700 square meters (8 acres) and an average volume of 76,000 cubic meters (over 20 million gallons); the ponds have an approximate area of 7,000 square meters (1.7 acres) and an average volume of 3,200 cubic meters (845,000 gallons). The work to be done in the first stage included rebuilding the walkways, raising their level and laying large rocks to border the ponds; clearing the cattails and other reeds in water-covered areas along the walkways to accommodate the ponds and water gardens; repairing the thatched-roof constructions and sanitary installations; improvement of the main access road; repairing the bridges along the walkways and the fishing dock; building a large waterfall; a major paint job for all buildings; and setting up lighting for night visitors. These works were carried out by the state government and the city administration. At my request, WGI Executive Director Kit Knotts made a first list of the waterlilies she considered we should have in the park. In October 2006 my friend Porfirio Suárez and I traveled to Florida to select the waterlilies for the Aquaparque. Shortly after that Craig Presnell of Luster Aquatic Nursery sent us a shipment of selected lilies, and Kathy Hanes of Florida Aquatic Nurseries sent us another one. We finally planted over 700 waterlilies of various colors and varieties, both local and imported, distributed mostly in the water garden ponds and some around the perimeter of the lake. Some 200 marginal aquatics were also planted, as well as a considerable amount of oxigenating plants. On the other hand, in the large lake we released 300 two-inch koi and 30,000 Chiclasoma urophtalmus fry; the idea is that when these fish grow, visitors will be able to go and fish from a dock designed for this purpose. The water was treated with Microbelift bacteria and amazing results were obtained, cleaning the water and achieving extraordinary clarity. Among the many varieties of tropical waterlilies of various colors we planted are the following: Nymphaeas 'Day Glow', 'Pink Flamingo', 'Lindsey Woods', 'Charlie's Pride', 'Midnight', 'Star of Siam', 'Director George T. Moore', 'Blink', 'Tanglewood Blue', 'Panama Pacific', "Pink Capensis", 'Tina', 'Wood's Blue Goddess', 'Midnight Embers', 'Foxfire', "Blue Capensis", 'Afterglow', 'Albert Greenberg', 'Star of Zanzibar', 'Madame Ganna Walska', 'Moonbeam', 'Evelyn Randig', 'Pink Pearl', 'Queen of Siam', 'Islamorada', 'Marian Strawn', 'Carla's Sonshine', 'St. Louis Gold', 'Rosa de la Noche', 'Antares', 'Jennifer Rebecca', 'Red Cup', 'Red Flare', "Juno" and 'Wood's White Knight', besides many unnamed waterlilies covering almost all colors. With the support of the Yucatán Center for Scientific Research (CICY) and the help of biologist Sigfredo Escalante, some 80 varieties of trees and plants, mostly endemic species, were selected for planting in the various areas. Hundreds of trees and palms, as well as many ornamental plants, were planted throughout the park. The Aquaparque was officially inaugurated on July 29th 2007 by Mayor César Bojórquez and Governor Patricio Patrón. We are still learning how to cope with nature in this very unique park, especially since the water level can vary considerably between dry and rainy seasons. 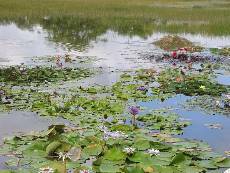 In May of last year during the height of the dry season when it is very hot (30-40° Celsius [86-104° Fahrenheit] in the daytime), the water level was so low that some ponds almost dried up and we had to move and replant quite a few waterlilies. The rains started in June but did not become regular until July; then the water level started rising (during the summer, it usually rains in Mérida every afternoon). However in October there were torrential rains which caused the water level to rise more than one meter (three feet), covering even part of the walkways until January of this year. 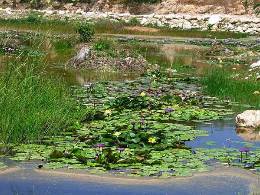 Waterlilies and other aquatic plants adapt easily to these changes because that is how they were designed by nature, but it does make pond management more difficult. When the next dry season comes the necessary changes and adaptations will be made, and we will divide and replant many waterlilies which are well established by now. The city administration is in charge of the Aquaparque's maintenance with a team of workers and guards led by Job Monforte, who looks after the waterlilies. Visitors increase every day. 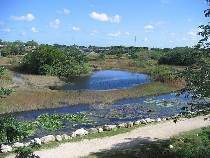 It is a very nice place to take a walk, to exercise and to admire the beauty of waterlilies and other aquatic plants, an oasis in the midst of Mérida and an unusual environment in this region. Four friends who have become water gardening enthusiasts -- Hernán Patrón, Manuel Abraham, Porfirio Suárez and myself -- have formed a nonprofit organization, Amigos del Aquaparque, to ensure its conservation and development. So far only the first stage of the master plan has been completed, mainly with the works described and the initial planting of waterlilies and other aquatic plants, as well as trees and palms in the dry areas. In the next stage we will try to increase and further develop the water gardens, and to continue the park's reforestation in peripheral areas. When you visit Mérida, do not miss the Aquaparque; it is very close to the highway to Cancun, approximately one kilometer south of that exit and a couple of blocks away from the "periferico" beltway. It really is worth it and you will love it. Profile - Fernando Molina O.M.